By the early 15th century, many Czechs had become adherents of Jan Hus (1369-1415), a religious reformer who attacked many of the beliefs, practices, and abuses prevelant in the Catholic Church. The Hussites, named after their leader, continued to be a powerhouse in Bohemia and Moravia even after the chilling death of Hus. He was burned at the stake in 1415 for preaching against the beliefs of the Catholic Church and the sale of indulgences. On the death (1419) of Wenceslaus IV of Bohemia the Hussites in Bohemia and Moravia took up arms to prevent his brother, Emperor Sigismund from entering into his succession. Jan Zizka , the Hussite military leader, expelled Sigismund in 1420 and routed him again at Kutna Hora in 1422. After the death (1424) of Zizka the division between the radical and the moderate parties of the Hussites the Taborites and the Utraquistswidened. A Taborite, Procopius the Great , succeeded Zizka as military commander of the Hussites. 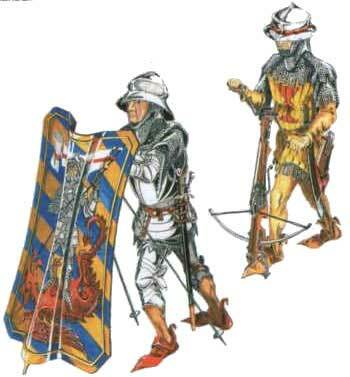 In 1425-26 a Hussite army invaded Silesia and Saxony, and in 1429-30 the united Hussite forces penetrated as far as Franconia. Several crusades against the Hussites were utterly routed by the Czechs, whose military organization and tactics were much superior to those of their opponents. Negotiations with the Council of Basel began, especially through the Univ. of Prague, and in 1433 the Czech delegates arrived at Basel. The result was the conclusion of the Compactata, by which the moderate Hussites were taken back into the Catholic Church. The Compactata were rejected by the Taborites. Civil war now broke out between the Utraquists and the Taborites (predominantly the party of the lower classes). At the decisive battle of Lipany (1434) the Taborites were routed and Procopius was killed. At a council meeting (1436) at Jihlava the Compactata were ratified and Sigismund was recognized as king of Bohemia. On the death (1439) of Sigismund's successor, Albert II, the Utraquist leader George of Podebrad governed Bohemia first in the name of Ladislaus V and from 1458 as king. He refused to accept the papal revocation (1462) of the Compactata and was declared deposed in 1466. A new war began between George and the nobles, and in 1468, Matthias Corvinus of Hungary attacked Bohemia. By the time peace was made (1478), long after George's death, the religious element of the wars had largely disappeared. War carts had been used to cover the camps in the rear of fighting armies quite early in various countries of Europe, in particular in France and Italy. However the first time the defensive tabor became of great importance was during the Hussite Wars in Bohemia (1420-1434). The Hussites moved in columns of horse-drawn carts, most of which were armor-plated, the sides pierced with loopholes. Inside these protected wagons or on other open four-wheeled carts, was a number of small bombards Troops were mostly footmen, highly disciplined by the intensive training and control methods established by Zizka in his Mount Tabor stronghold. In addition he had a small force of lightly armored cavalrymen, used for reconnaissance and for counterattack. Since the infantry absolutely prevailed in the Hussite armies, it might be effectively covered against the charge only by the carts. These carts seemed to be like moving fortress on the strength, which the battle has been waged. 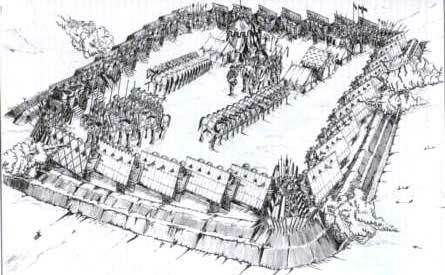 Whereas previously the cart had been used only when the cavalry failed, then during the Hussite Wars the cart became a fundament of the army formation on the basis, which a given battle has been waged. 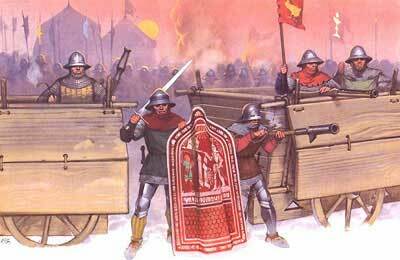 Depending on the terrain Hussites prepared the carts to the battle forming them in square or circle. The carts were joined by means of the chain (wheel to wheel). Therefore the carts were located aslant (their corners attached to each other) in order to allow, if necessary, to harness the horses quickly. . In front of this wall of carts a ditch was dug by camp followers. The crew of each cart consists of 18-21 soldiers: 4-8 crossbowmen, 2 handgunners, 6-8 soldiers equipped with pikes or flails (flail was hussite “national weapon”), 2 shield carries and 2 drivers. The battle, during which the cart was used, was waged in two principle stages. The first one was defensive; the second one was offensive (counterattacking). In the first stage the army placed the cart nearby the enemy’s army and by means of artillery fire it provoked this enemy into the battle. As a matter of fact the artillery fire inflicted heave losses on the knighthood standing in close arrangement. In order to avoid more losses the knighthood finally attacked. Then the infantry hidden behind the carts by means of firearms and crossbows warded off the attack weakening the enemy. The shooters aimed first of all at the horses depriving the cavalry of its main trump. As soon as the enemy was enough morally and physically weakened the second stage of the battle has begun – that was the aggressive stage. Suddenly the infantry and the cavalry burst out of the carts striking violently at the enemy – mostly from the flanks. While fighting on the flanks and being shelled from the carts the weak enemy could not put too much resistance. Finally it was forced to withdraw and leave its knights who dressed in the heavy armours and being without the horses could not escape from the battlefield. That was the reason that the enemy’s armies suffered so heavy losses of the knights and were absolutely terrified of Hussites who was famous for not taking the captives!